I have this plugin working on several sites, its easy to use and functions well. I have only had one support issue which was sorted out quickly and efficiently by the support team. Contact form plugin for WordPress website is the best solution to receive messages from customers right to your email address(-es). Download, activate and paste [bestwebsoft_contact_form] shortcode on any page, post or widget to display the form. 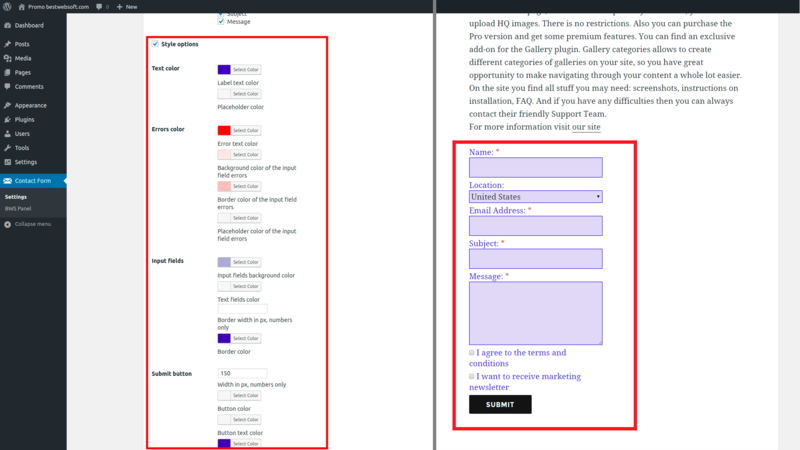 Customize the form styles and contents easily with the pre-build options. Allow your customers to reach you in seconds! BestWebSoft is always the perfect solution for you. Just check out what other people are saying about us! Liked it so much that I purchased the Pro Version. Used a few times now. Works every time. 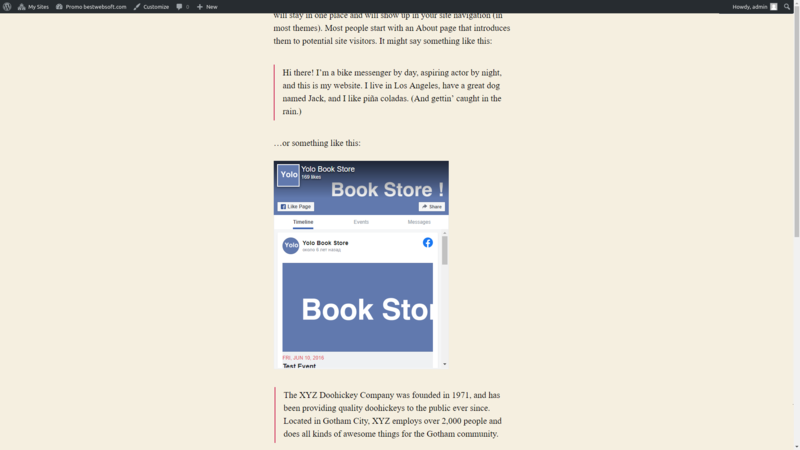 I really like how the BWS plugins integrate with each other according to the needs of various websites. What I’ll get after purchase? Thankful letter with awaiting payment approval. 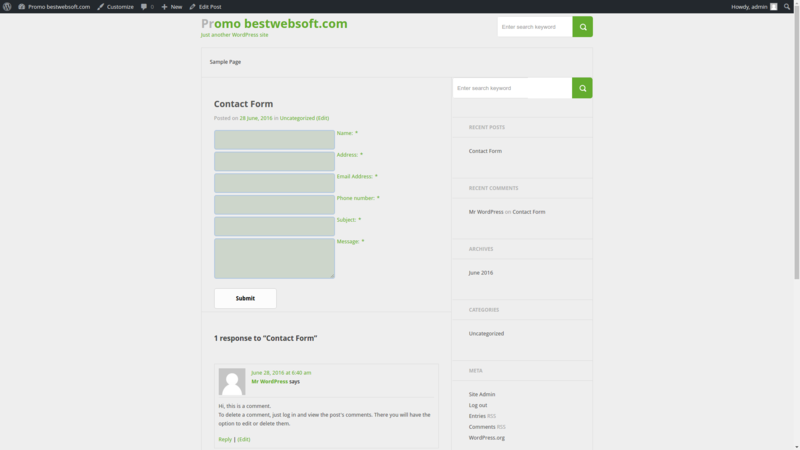 User registration email with an access to your personal Client Area on BestWebSoft website (https://bestwebsoft.com/client-area), where you can manage your websites, licenses and find purchase information. Successful purchase confirmation email with your license key and download link. If the system considers your purchase as fraud, your payment will not be transferred to us, your money is left at 2CO and 2CO will refund it to you (as a rule, within 1-2 days). No further actions needed. If you want to complete the purchase, we recommend using another payment method. What’s included in Pro license? When you buy a Pro license, you are supposed to get downloadable ZIP archive with Pro license key including personal support, all documentation and videos, constant updates, and special offers. What is the Priority Support? Priority Support is an answer to your question within one business day. For more info see Support Policy. Didn’t receive anything, got charged. What should I do? You will get the download link after transaction review. Usually, it takes about 30 minutes to review one transaction. You will receive a message with a download link and license key to the email specified by you during the purchase. What’s the difference between Annual and Lifetime licenses? With Annual license you will receive product updates and priority support for 1 year. You will be charged automatically each year until this license cancellation. With Lifetime license you will receive product updates and priority support forever (see License Agreement for more details). Pro Membership is a subscription which gives you access to 30+ premium WordPress plugins, plus all the future plugins we’ll release over the course of your Pro Membership subscription for a single website/domain. Updates and dedicated support are included through the license lifetime. What will happen if I cancel my membership or subscription? Will I still have access to the plugins I’ve purchased? In case of payment cancellation you will no longer receive top-priority support and product updates, however, you will be granted lifetime rights to use the product. Support will be provided on a regular basis. How can I change the license from Pro to Pro Membership? Cancel your previous Pro license and buy Pro Membership license. Then add new license key to your website. How can I change the license from Annual to Lifetime? Cancel your previous license and buy Lifetime license. Then add new license key to your website. Can I use a single Pro license for multiple websites (domain names)? One premium plugin can be installed on a single domain and its subdomains. You should buy separate licenses for each website/domain. NOTE: We do not support websites, which use Domain Mapping or similar plugins/server configurations. #1 super security anti-spam captcha plugin for WordPress forms. Add unlimited number of contact forms to WordPress website. Save and manage Contact Form messages. Never lose important data. Some of these translations are not complete. We are constantly adding new features which should be translated. If you would like to create your own language pack or update the existing one, you can send the text of PO and MO files to BestWebSoft and we’ll add it to the plugin. You can download the latest version of the program for work with PO and MO files Poedit. * Bugfix : The ability to translate GDPR Compliance has been fixed. * NEW : The ability to attach multiple files has been added. * Bugfix : The bug with wp-options call has need fixed. * Update : The plugin settings page has been changed. *Bugfix : The compatibility issue with Captcha plugin has been fixed. *Update : The compatibility with WordPress version 5.0 was updated. * NEW : GDPR Compliance has been added. * Update : Czech language file has been updated. * Bugfix : The compatibility issue with Contact Form Multi plugin has been fixed. * Bugfix : The compatibility issue with Google Captcha (reCAPTCHA) plugin has been fixed. * Bugfix : The compatibility issue with Captcha plugin has been fixed. * NEW : The Indonesian language file has been added. * Bugfix : The compatibility issue with Google Captcha (reCAPTCHA) plugin was fixed. * Bugfix : The bug with Email field displaying in Appearance tab was fixed. * NEW : The ability to change width for contact form fields has been added. * Update : French language file is updated. * Bugfix : Multiple Cross-Site Scripting (XSS) vulnerability was fixed. * Update : The French language file is updated. * Bugfix : The bug with selecting language via BWS Shortcode button was fixed. * Bugfix : The bug with enabling/disabling Captcha on the plugin additional settings page was fixed. * Bugfix : The bug with re-ordering Captcha on the plugin appearance settings page was fixed. * Bugfix : The bug with customizing form on the plugin appearance settings page was fixed. * Update : BWS Panel section was updated. * Update : The shortcode [[contact_form]] has been deprecated. * Bugfix : XSS vulnerability was removed. * Bugfix : The bug with displaying google captcha has been fixed. * Update : An ability to enable/disable Captcha, Google Captcha, Subscribe checkbox and an ability to save email to the database for each multi forms (if Contact Form Multi by Bestwebsoft is activated). * Update : Color picker script was replaced. * NEW : The ability to add custom styles to frontend of your site has been added. * Update : The Spanish language file is updated. * Bugfix : The bug with adding options to the database was fixed. * NEW : Compatibility with plugin Subscriber. * NEW : The Danish language file is added. * NEW : The Czech language file is added. * Bugfix : The bug with sorting on mobile devices was fixed. * Bugfix : Bug with the options saving on the settings page (appearance tab) was fixed. * NEW : An ability to sort contact form fields was added. * NEW : An ability to displaying contact form in 2 columns. * NEW : An ability to change the contact form alignment. * NEW : An ability to change labels position in the contact form. * NEW : An ability to change labels align in the contact form. * NEW : A button for contact form shortcode inserting to the content was added. * NEW : The Dutch language file is added. * Update : The method of the URL obtaining in the attribute “action” of the contact form has been changed. * Bugfix : Vulnerabilities with `$path_of_upload_file` and `$form_action` was fixed. * New : We’ve made it possible to make Department field required. * New : Ability to restore settings to defaults. * Bugfix : We fixed syntax error. * Update : We updated all functionality for wordpress 4.2.4. * Update : We fixed the url after the form is submitted. * Update : We fixed display form for rtl. * Update : We fixed ‘Send me a copy’ email with the attachment. * Update : We fixed error of a visual display of the settings page. * Update : We updated all functionality for wordpress 4.2.2. * Bugfix : Bug with Contact Form impacting ‘From name’ headers in messages sent by other plugins was fixed. * Update : ‘Additional options’ block was moved to a new tab, which is now named ‘Additional settings’. * Update : ‘Extra settings’ tab name was changed to ‘Appearance’. * NEW : The Greek language file is added. * Bugfix : We fixed the bug with attachment. * Update : The Estonian and Japanese language files are updated. 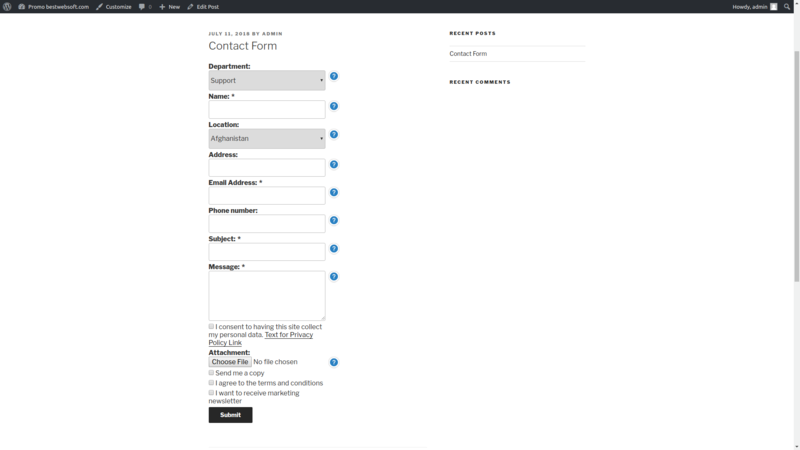 * NEW : We added functionality for displaying two or more contact forms on a single page. * Update : We changed the layout of Contact Form from fixed to responsive. * Bugfix : We fixed the bug with network activation. * Bugfix : We fixed the bug with close banner button. * Update : The Russian, Slovak and Ukrainian language files are updated. * NEW : The Norwegian language file is added. * Bugfix : Bug with saving email addresses with long domain part was fixed. * Bugfix : Bug with saving options during the first installation was fixed. * Bugfix : Bug with saving several email addresses was fixed. * Bugfix : Bug with saving redirection link was fixed. * Bugfix : The bug with not supported MIME type error was fixed. * NEW : Auto Response is added. * NEW : Ability to substitute “name” and “email” fields with User’s data for logged-in users, as well as to hide and make these data disabled for editing. * Update : We updated all functionality for Email Queue plugin. * Bugfix : The bug related to overwriting of the attachments with the same names was fixed. * NEW : We added ability to use the changed names of the fields of the contact form in the sent letter. * NEW : We added location selectbox. * Bugfix : We fixed the bugs with Contact Form Multi plugin. * NEW : The Spanish language file is added. * Bugfix : We fixed the bug of loading the user’s list ( We have limited the list “The user’s email address” on the settings page to the lowest role – author ). * Update : We updated all functionality for wordpress 3.9. * NEW : Compatibility with plugin Contact Form Multi Pro. * Update : The Ukrainian language file is updated. * NEW : The Afrikaans language file is added. * Bugfix : We fixed the bug of the user’s list on multisite. * NEW : Compatibility with plugin Contact Form Multi. * NEW : ‘xlsx’ mime-type is added. * NEW : Added transition to the contact form after submitting. * Bugfix : We fixed the bug of duplicate MIME-Version. * NEW : The Estonian and German language file are added. * NEW : Setting of choice for the form’s action URL ($_SERVER[‘HTTP_HOST’] or $_SERVER[‘SERVER_NAME’]). * NEW : The Turkish and Vietnamese language file are added. * NEW : The department is added in email. * NEW : The Chinese language file is added. * Update : We updated all functionality for wordpress 3.8. * Update : We changed capability to ‘manage_options’ for the plugins settings pages. * NEW : Ability to reorder elements in the department’s list. * NEW : Ability to send email in plain format. * Bugfix : We fixed the bug related to warning while saving settings. * NEW : Ability to hide, make disabled or define subject and message fields. * NEW : Ability to not use name field. * NEW : We added mime types for .aar and .sce files. * NEW : Add checking license key in the plugin settings page. * NEW : Add Privacy checkbox (Required checkbox for submitting the form). * NEW : Add Optional checkbox (Optional checkbox, the results of which will be displayed in email). * Bugfix : We fixed the bug related to use html-special chars. 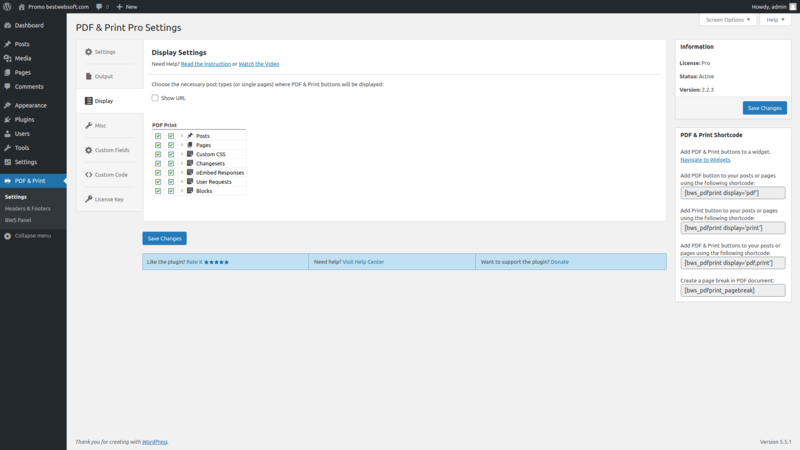 * NEW : Add checking installed wordpress version. * Update : Activation of radio button or checkbox by clicking on its label. * Update : We updated all functionality for wordpress 3.7.1. * NEW : Add option for saving emails into the DataBase. * Update : We updated all functionality for wordpress 3.7. * NEW : Compatibility with plugin Contact Form To DB. * NEW : Ability to change required symbol (asterisk). * Update : The Brazilian Portuguese language file is updated. * NEW : Ability to use the name of the user who fills the form in the field ‘From’. * Update : The and French language file is updated. * Update : We updated all functionality for wordpress 3.6.1. * NEW : Ability to add SelectBox to the contact form with the title Department, where the message will arrive. * Bugfix : We fixed the bug related to manage languages on the plugin settings page. * Update : Function for displaying BWS plugins section placed in a separate file and has own language files. * Update : Compatibility test with 20 most popular WordPress plugins. * Bugfix : We fixed the bug of the wrong message tooltip. * NEW : Compatibility with Captcha Pro. * NEW : Ability to add field “Reply-to” with user email to the email header. * Bugfix : We fixed the bug related to ‘docx’ mime type. 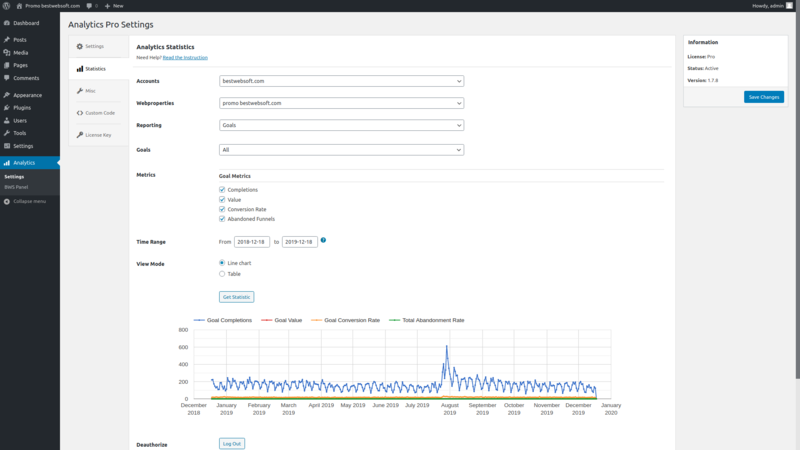 * Update : We changed plugin settings page displaying. * NEW : Added an ability to delete an attachment file from the server after the email is sent. * NEW : The Slovak language file is added. * Update : The Japanese language file is updated. * Bugfix : We fixed the bug related to XSS attack. * Bugfix : We fixed the email validation bug. * Update : We removed displaying of additional info in the copy of email to the sender. * NEW : Added an ability to use diffrent shortcodes. * Update : The Swedish language file is updated. * Bugfix : We fixed the displaying bug. * NEW : The setting of displaying Captcha is added. * NEW : Added an ability to view and send system information by mail. * NEW : The Catalan language file is added. * NEW : The Finnish language file is added to the plugin. * Update : An ability to enable/disable Captcha, Google Captcha, Subscribe checkbox and an ability to save email to the database for each multi forms (if Contact Form Multi is activated). * Update : The styles for reCaptcha were updated. * Update : We updated all functionality for wordpress 4.3. * Update : Text Domain was changed. * Bugfix : We fixed ‘Send me a copy’ email with the attachment. * Bugfix : Bug with undefined function on plugin’s settings page was fixed. * Bugfix : Bugs with syntax error and undefined function were fixed. * Bugfix : Error with option name when Contact Form Multi plugin is activated was fixed. * Update : Plugin performance was improved. * Update : BWS plugins section was updated. * Update : The Estonian language file is updated. * Update : The Norwegian and Russian language files are updated. * Bugfix : We fixed the bug with saving ‘The $_SERVER variable that is used to build a URL of the form’. * Update : The Slovak language file is updated. * Bugfix : We fixed the bug with getting default settings. * Bugfix : We fixed the bug with plugin Contact Form Multi. * Bugfix : We fixed the bug of db table creation. * Update : Screenshots are updated. * Update : We updated all functionality for wordpress 3.8.2. * NEW : A notice when changing settings on the plugin’s settings page was added. * NEW : Ability to change tips below the Attachment block. * NEW : Add hide-button for the settings page. * Bugfix : We fixed the bug of uploading attachment in multisite. * NEW : Ability to not display asterisk near required fields. * Update : We updated all functionality for wordpress 3.6. * Update : We updated all functionality for wordpress 3.5.2. * Bugfix : We fixed the bug of display additional info in the email when email has an attachment. * NEW : Added html blocks. * Bugfix : The error related to use function ‘get_userdatabylogin’ instead ‘get_user_by(‘login’)’ is fixed. * Update : We updated the Italian, the French and the Brazilian Portuguese language files in the plugin. * NEW : Added email adress as additiional form field. * Bugfix : We fixed the bug of adding an attachment. * Update : We updated the English text in the plugin file. * Bugfix : We fixed the bug of displaying phone error messages when a phone number field is not display. * Update : The Serbian language file is updated. * Bugfix : The bug after clicking submit, when site uses a custom port, is fixed. * NEW : Added ability to change a label ‘Send me a copy’. * Bugfix : The bug of changing the message ‘Action after email is sent’ was fixed. * NEW : Hungarian language file is added to the plugin. * Bugfix : The bug of displaying error messages was fixed. * NEW : Ukrainian language file is added to the plugin. * NEW : We added HTML tag for the text, that is displayed after email is sent. * NEW : Belarusian language file is added to the plugin. * Update : European Portuguese language file is updated. * Bugfix : The error related to the cross-site scripting vulnerabilities was fixed. * Update : We changed the English text in the plugin file and all language files were updated. * Update : Dutch language file was updated. * Bugfix : Bugs in admin menu were fixed. * Update : We updated all functionality for wordpress 3.5.1. * Update : Swedish language file was updated. * Bugfix : The error related to extra “rn” in the user email address when using WP_mail and in the Name field when using php_mail was fixed. * Update : We updated all functionality for wordpress 3.5. * Bugfix : The error related to the empty label on the contact form was fixed. * NEW : Galician language file is added to the plugin. * NEW : Multilanguage labels for fields is added to the plugin. * Update : The shortcode structure was changed. * Bugfix : The error related to the saving of the field “Change FROM fields of the contact form” was fixed. * NEW : The setting of the required fields was added. * NEW : Persian language file is added to the plugin. * Update : The email address validation was changed. * NEW : Added phone number as additiional form field. * NEW : Serbian language file is added to the plugin. * NEW : Czech and Romanian language files are added to the plugin. * Bugfix : Cross Site Request Forgery bug was fixed. * NEW : Japanese language file is added to the plugin. * NEW : Hebrew language file is added to the plugin. * Update : We updated French language file. * Update : We updated all functionality for wordpress 3.4.1. * Update : In the email in the field Date/Time used correct time zone – instead of UTC we use local settings which are setup on the page Settings -> General. * NEW : Added ability to select action after the send mail – Display text or Redirect to page. * Update : We updated all functionality for wordpress 3.4. * Bugfix : The bug of email address validation in admin section was fixed. * NEW : Arabic and Hindi language files is added. * NEW : Added ability to display or hide explanations after Attachment block. * NEW : Danish and Greek language files is added. * NEW : Added ability to send mail using the functional: wordpress wp_mail function or php mail function. * Bugfix : The form output code is validated. * New : The feature to setup the displaying of the additional information fields in the email was implemented (Sent from (ip address), Date/Time, Coming from (referer), Using (user agent)). * Bugfix : The bug of attribute action on element form was fixed. * NEW : Added ability to change FROM fields. * Change : French language file is changed. * NEW : Added ability to upload wav and mp3 files. * NEW : French language file is added to the plugin. * NEW : Added ability to use the contact form shortcode as widget in the sidebars. * Change : The change was done to an email sending functionality – now it is using wordpress functionality only. * NEW : Bulgarian language file is added to the plugin. * NEW : Spanish language file is added to the plugin. * Change : Code which includes styles and scripts is added to the plugin for correct SSL verification. * NEW : Norwegian language file is added to the plugin. * NEW : Polish language file is added to the plugin. * NEW : Dutch language file is added to the plugin. * Bugfix : The bug of sending emails to admin user even if a different user is specified when setting plugin to “use email of wordpress user” was fixed. * Bugfix : The bug of sending a blank attachment field of the form was fixed. * NEW : Brazilian Portuguese and Turkish language files were added to the plugin. * NEW : German language files are added to the plugin. * Bugfix : The bug related to resending of an email after the page is updated was fixed. * NEW : Italian language files were added to the plugin. * NEW : A possibility to change a label when the fields of the form are displayed. * Changed : Display of the files types names that user can attach to an mail. * NEW : ‘Attachment’ and ‘Send me a copy’ blocks were added to the contact form. * NEW : Language files are added to the plugin. * Slashes bug in email is fixed and server info is added to email. * The bug of complex form validation when captcha is not used in the contact form is fixed. Please upgrade immediately. 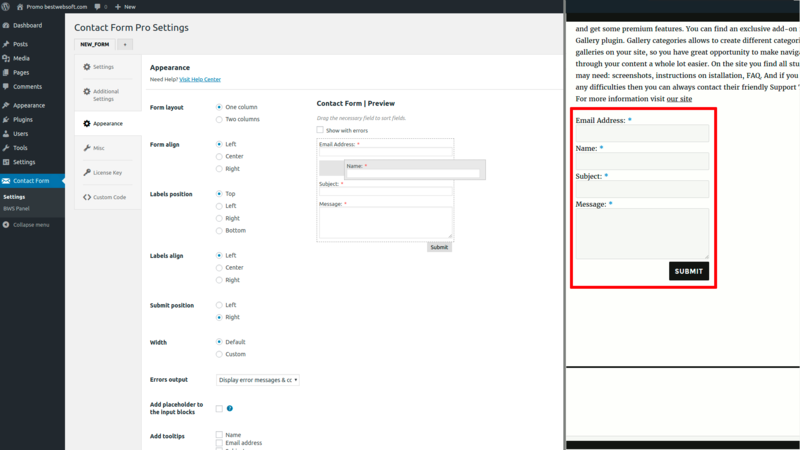 * The bug of complex email validation when filling in the contact form is fixed. * BWS Plugin’s menu section was fixed and right now it is consisted of 3 parts: activated, installed and recommended plugins. The bug of positioning in admin menu is fixed. Translation omissions are corrected. Now there is a link where it is possible to see the site where email comes from. * BWS Plugin’s menu section was fixed and right now it is consisted of 2 parts: installed and recommended plugins. Icons displaying is fixed. * The bug with the link to the settings page is fixed in this version. Please upgrade the plugin immediately. * Usability at the settings page of the plugin was improved. * Contact form email address bug is fixed. * “Thanks” message display bug is fixed. Radio buttons automatic switching is added (for the settings page) after setting mouse cursor (clicking) at a text field. * Contact form positioning bug is fixed. * Ability to add Contact Form into a post. Ability to adjust displaying of the form via shortcode is added.